...cause it's 20 degrees in NYC. Dinner at the vibrant Tap Tap. I'd never tasted Haitian food before, but dinner was incredibly flavorful, drinks were strong, prices extremely reasonable. 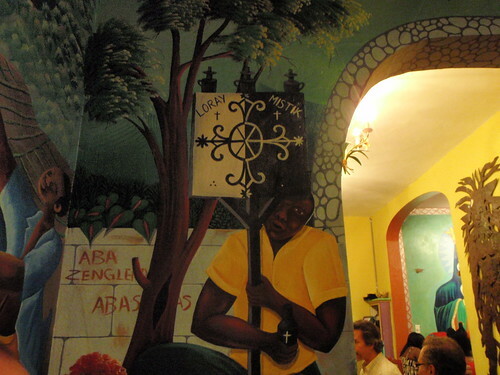 Spinach in coconut sauce, shrimp in a red curry sauce, melt-in-your-mouth whole fish, and gorgeous murals to gaze at. One of the best local culinary experiences in Miami. 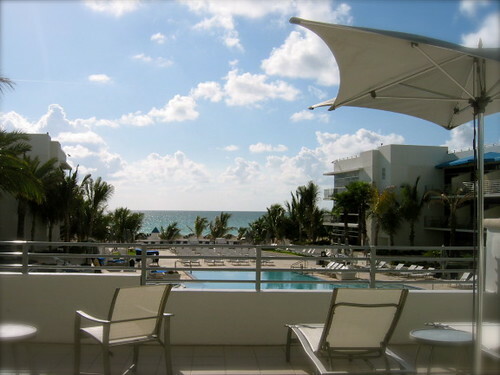 Miami, in between Fay and Gustav, we found refuge at the Ritz Carlton South Beach. The sun made an appearance for 2 1/2 days, and while I wasn't sure that traveling straight into the potential path of a hurricane was the best decision, it turned out to be a good time to go. Mainly because Miami is a lot cheaper when storms are threatening, and everyone who lives there is out of town. Outside my window, a band plays latin jazz by the pool as hotel guests in bikinis and swim trunks enjoy their first - third - or fifth cocktail of the day. I'm at the Ritz Carlton South Beach, a hotel that on first glance was somewhat ho-hum. There is a lot of competition for eyeballs in South Beach. I toured the hotel this morning with the sales director, and it has since surpassed my expectations. Incredible attention to detail and gorgeous architecture. And, amidst all of the noise in South Beach, it is a quiet spot. I am here to take a break, and revive portablemind while I'm at it. While I've been way overdue for a good post, I've spent much of my time posting 140 character "mini posts" on Twitter. Today, I realized that Twitter is a perfect writing tool. I "tweet" throughout the day, and then have the perfect set of notes to construct a longer post or article. I love it. Despite technology replacing my memory, and my handwriting continuing to deteriorate. from Rubell and Fendi to Jimbo's, we ended the day of Total Miami Immersion with the ultimate destination, South Beach. I purposely split the group up and sent them out in trios to different hotels so as to experience the SoBe lifestyle, interact and, god willing, drink. After cocktails we reconvened at Casa Casuarina, otherwise known as the Versace mansion. 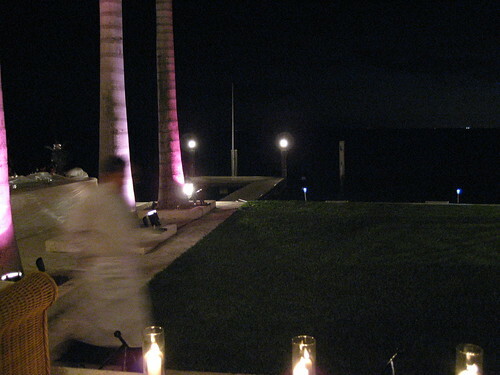 Barton G, the Miami events company that worked with me all week and provided us with a backstage pass to Fabulous, designed an outrageous dinner in the courtyard by the pool. 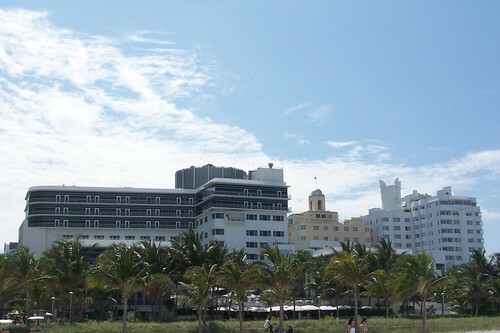 It's interesting to watch people who don't get out much experience a place like South Beach. Later on in the evening I asked one colleague who was sitting by himself, no drink in hand, whether he was alright. Incredulous stare on his face, he replied "Fine, I'm just happy to look ... I can't believe that people actually look like this!" For god’s sake, doesn't anyone watch CSI Miami? The design district is still a bit edgy as it undergoes revitalization, so I thought to myself while wandering around - if I lived here, this is the neighborhood I would buy in because it’s got to be really cheap. I later learned that as Miami begins to supplant New York as the place where international artists show their work first and/or exclusively, it's actually some of the most expensive real estate in town. We weaved in and out of galleries and furniture stores like Fendi Casa, where I coveted everything (this was clearly an aspirational outing for me as I learned that my taste is way more expensive than I thought). Even if you cannot afford anything, it is worth a visit for so many reasons - the brand, the design, the quality of fabric, the colors. And thankfully the sales manager who chatted with us was gorgeous, making everyone forget all about what they had just seen at Rubell. I had a good dose of envy on this particular visit. New Yorkers feel that they have an edge over other cities because we think New York is where the cream of the crop is, especially when it comes to design and international style (and food). In Miami, I could feel the rug being pulled out from underneath us. Partly cloudy and windy. High around 35F. Winds NW at 25 to 35 mph. Winds could occasionally gust over 50 mph.Currently 28F, feels like 14F. 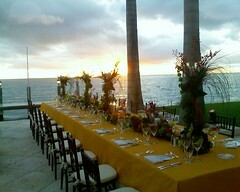 The beautiful photo was taken last week in Key Biscayne, just before we sat down to dinner. "Outside! in January!" everyone exclaimed, as they took their seats and wondered what the poor people were doing. Walking the streets of Manhattan in the freezing cold, that's what. Deep breath. Once we got over that obstacle, lunch turned out to be a surprising smash. The state attorney for Florida, Katherine Fernandez Rundle was lunching with the Miami Chief of Police John Timoney at a table nearby and one of my brilliant colleagues had to engage them, if only for a moment, to tell us something… anything about the city. They joined us for 5 minutes and I was amazed at the unbelievable power and presence that the two of them had together. 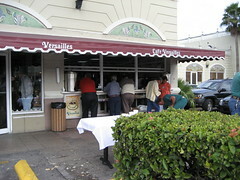 Considering that Versailles is the spot in the neighborhood for Miami’s powerful, paticularly in the Cuban community, I thought later how aptly named it really is.